We all know how bad processed sugar is for us. I won’t rehash it. A mere teaspoon full can depress our immune system for up to six hours. Not to mention the cumulative effects of weight gain and metabolic diseases like Diabetes and Heart disease. And cancer? Basically if they gave mice that were already genetically modified for breast cancer the same amount of sugar in a typical Western diet, the tumors got bigger faster. * 36 Grams per Day. Experts generally agree about 36 grams of sugar per day is what would be a healthy amount. That’s about 9 teaspoons, the upper end of the 6-9 teaspoons recommended by the WHO - World Health Organization. Ok so fruit does have naturally occurring sugars and some anti-sugar activists I may have bought cook books from say yes, you SHOULD feel guilty about eating that fifth piece of watermelon. If it comes from a tree or grew from the ground, I’m going to eat as much as I please and assume my body knows how to handle naturally occurring fructose. Same goes for honey and maple syrup. Maybe in a few years I can see cutting back on the gallon of maple syrup and honey I use but for now, I’m targeting the obvious sugar culprits - pop (or soda for my American friends) white breads and processed foods. Low fat does NOT mean low in sugar. CEREAL: To give you an example, I have some hoity toity organic whole grain shredded wheat. (KASHI organic cinnamon harvest) and you know what? My box of kid-loved Alphabits has LESS sugar than my fancy ‘good for you’ adult cereal. Huh. 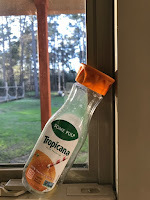 JUICE: I was drinking some orange juice which, by the way, does not label sugar in the ingredients. (Pure Orange Juice!) but it DID have 34 grams of sugar for one small to-go bottle. Whoops. I’m actually ok with this as it is naturally occurring (Although I would never naturally eat the 10-12 oranges at one time that go into one bottle). Is this cheating? Maybe. I’m ok with it. MYTH DEBUNKED: *Skim milk does NOT have more sugar than whole milk. Just FYI - I’m not a scientist but when I look at the ingredients on the skim milk package vs same brand whole milk, there is exactly 12 grams of sugar in skim, and 11 in a cup of whole. (Remember math!?) Four grams equals one teaspoon. Anyway, whether you agree with me or not that sugar is TOXIC, with the rates of obesity tripling in the last decade and the incidence of heart disease and diabetes attacking younger and younger kids, something is amiss. WHY I’M BACK ON THE BAN-SUGAR TRAIN: I’ve been sick with a cold pretty much since Ben was born. Two round of antibiotics and the doctor says sinus surgery is probably the next step. I think cutting out processed food and sugar (Unnaturally occurring) and striving for a mostly plant based diet (more veggies and fruits than meat. Less dairy) is a much less drastic move than, say, submitting my face to a surgeons knife to find relief. We’ll give this a try and see how it goes. It costs me nothing. I am convinced that the body WANTS to heal itself. You just need to give it the fuel it needs to do so. This is day five of my no-sugar, less meat diet (meat as a flavoring, not as the main course) and I still have that cold but I feel much better. I have more energy, my head feels clearer, and the annoying cravings are starting to fade. I’m starting to WANT foods that are better for me because of how great I feel after. THE QUOTE: Sugar is EIGHT times more addictive than cocaine. (Mark Hyman, MD). And…I’m giving this to Ellie!? Ahhh, what am I doing? My new mission in life? Eat healthier, and find ways to slowly cut processed sugar out of my life. Probably one of the hardest things I’ve ever tried to do. Maybe I’ll start a rehab for sugar addicts like me. ‘Angela’s Sugar Shack Shake Down….’ Any takers?